If you don’t give an InkCanvas an explicit Height or Width, but leave both to default to Auto, the InkCanvas automatically sets its MinHeight property to 250 and its MinWidth to 350. This is done using a trigger, created in the constructor of the InkCanvas. This can be confusing, since the same is not true for the Canvas control, whose MinHeight and MinWidth properties are initially set to 0.0. 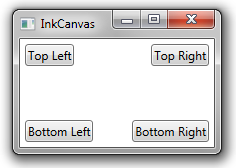 Below, we include an InkCanvas control in a window and attach a button at each corner, so that we can better see its boundaries. 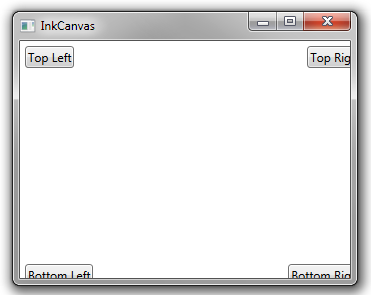 The InkCanvas sizes to fit its container (the Window), but you can see that a minimum height and width has been set. To allow the InkCanvas to size freely, set MinHeight and MinWidth to 0.0. I believe these values are backwards. My InkCanvas in WPF 4.5 has a minimum height of 250.